2 by 3 Heroes: Pride? I ain't got that. I make a lot of throwaway comments in and around the blogsphere. Most of them have the purpose to create humor . Sometimes, though, I'll make the comment with the hope that an underlying intention comes to light. That's what happened a month or so ago on a post on AJ's' The Lost Collector blog. AJ was talking about a nice trade with a new blogger that netted some mighty pretty vintage. I had been following a trail of posts from this same trader on a few other sites, so I made the throwaway, but serious, comment of "what do I have to do to get in on this'. Luckily, Mark read my comment, sent me an email and we worked out a nice little trade. I still think Mark has not started a blog (correct me if I am wrong), but for a place to send all my 1990 thru mid 2006 BoSox cards, and some relics that have been collecting dust on my trade bait, Mark sent some gorgeous vintage. When I think hockey, this is the year that comes to mind first. 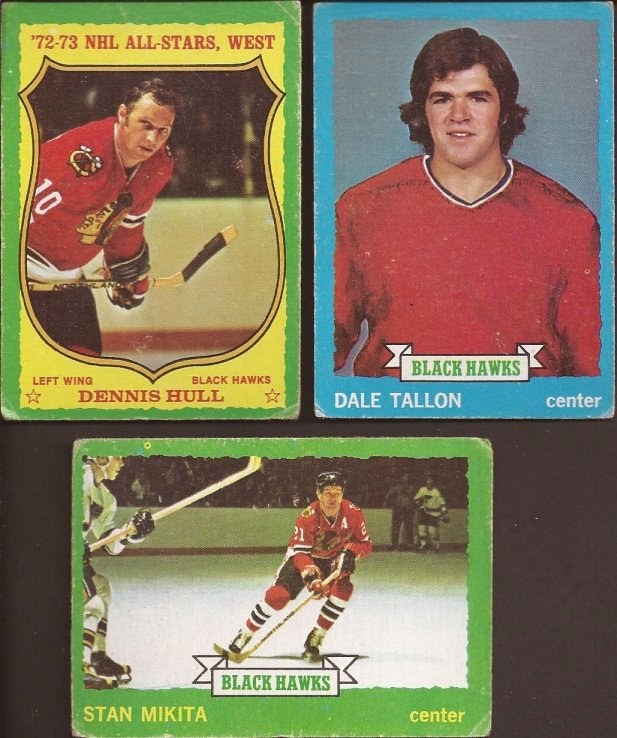 I think the 72-73 was one of the first hockey cards I ever purchased. I had a ton of these beige borders in my shoebox, but long ago lost them all. Mark sent a nice selection of my boys for this year. Plus for the following year of 73-74. Love that shop job on Tallon's jersey. And check out Stash about to tear through the Blues defense. Quick side note before I head to the rest of the card - Seabrook getting 3 games for the hit on Backes is BS. I expect one, maybe two. Three is excessive for someone with no history of malicious hits. Hell - there wasn't even a call until a few minutes after the play. More proof that Brendan Shanahan is a moron. Ok - back to Mark's goodies. Vintage Blackhawks were joined in the package with vintage White Sox. 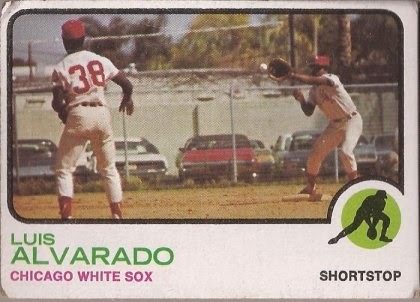 I am still woefully short on early White Sox, so a handful of '72s were a welcome site. Love Bradley's color changing lenses. Lastly were some '73s. After I finish my 1964 set, I am going after a '73. It's far too great a set of images to forget. I have this Andrews already, but this beaut goes into the double play binder. And Topps really needs to bring back the coaching staff cards. Not just the manager but all the major coaches. Best card in the envelope, however, was this rectangle. YES!!!! I finally own a Luis Alvarado! I showed this to my wife - she got this look on her face and asks "where the hell are they playing? What's with the barbed wire?" I never really noticed how the shadows/tree limbs give that look about the fence. Or maybe it is barbed wire. But thanks for the trade, Mark. Begging really pays off. Alvarado = BEST CARD EVER. Mark is as generous as they come. It always feels like I'm catching my significant other in the arms of another man when I read about Mark sending other people 73 Topps cards. "HOW COULD YOU?!" lol, but no, he's the best. Great batch of hockey there! That Alvarado card is awesome. Thanks for the trade Jeff, I have some 64's heading your way.